Vice President and Environmental Affairs Business Initiatives Manager for Wells Fargo & Co.
Like many organizations, Wells Fargo has a small environmental affairs team. We rely on a network of environmentally-minded colleagues to ensure we successfully implement our corporate environmental strategy. With more than 70 Wells Fargo Green Teams operating at locations across our corporate footprint, we are fortunate to have a wonderfully engaged and active network to support our work. Last year, we embarked on a Green Team business planning process that we hoped would help us better align our limited resources and better track our collective progress toward our 2020 sustainability goals. To help us document and verify our financial and environmental impact, we worked with True Impact, a Boston-based organization that provides web tools and consulting support to help corporations measure the social, financial and environmental ROI of their corporate responsibility programs and operations. 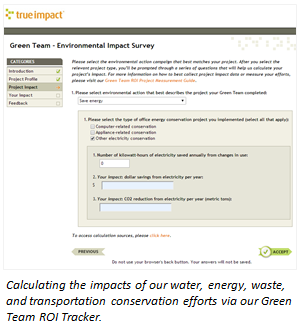 Guided by the expertise of Sadie Miller, True Impact created a first-of-its-kind Green Team ROI Tracker, a tool that allows any organization to calculate the impact of Green Team-led office campaigns. We were thankful to work with True Impact on this project as tracking the results of a dispersed network of leaders can be difficult and the Green Team ROI Tracker helped make it easier for us to collect data, calculate results, and streamline reporting. True Impact also created an accompanying Green Team measurement guide so that we could ensure we use established standards and metrics, particularly around topics like commuting and energy. Helped us achieve our 65% waste reduction goal by hosting a number of recycling events and education campaigns to increase awareness and use of local options, resulting in an estimated 1,000,000+ lbs. of personal and office waste diverted from landfills. Enabled us to increase energy efficiency by 40%, running local energy campaigns that encouraged team members to turn off monitors and change out light bulbs. Green Team-led campaigns in Charlotte, NC and Frederick, MD helped Wells Fargo save an estimated $62,000, as calculated by local estimated kWh savings and energy rates. Green Teams were also instrumental to helping us achieve LEED certification in 9 of our administrative buildings last year. Active teams at each location helped Wells Fargo qualify for a LEED Innovation credit. We also made progress towards our goal to reduce GHG emissions by 35% by 2020 based on our 2008 baseline results. In 2013, Wells Fargo Green Teams helped reduce our Scope3 emissions through commute campaigns, resulting over 1,400 gallons of gas, equating to roughly 12.6 metric tons of CO2. From running energy efficiency campaigns and recycling programs to managing community volunteer events and supporting our US GBC LEED® certification work, our Wells Fargo Green Teams have helped our company save money and protect the environment through their local efforts. We are now actively sharing our impact numbers and local Green Team accomplishments with company leadership so we can continue to grow our engagement programs. We invite you to share your comments on our first attempt at tracking and communicating our grassroots impact. We’d also love to hear your ideas on projects that worked well in your office or community so we can continue to share best practices and grow our collective, positive impact on the environment. Please share your thoughts with us on our blog: Wells Fargo Environmental Forum. Krista Van Tassel is vice president and Environmental Affairs business initiatives manager for Wells Fargo & Co. In this role, Van Tassel heads community and team member engagement for Wells Fargo’s environmental sustainability group. Van Tassel is responsible for leading more than 70 Green Teams, which are employee-led volunteer groups promoting environmental practices within the company and local communities through education, outreach and volunteerism. She also manages Wells Fargo’s Environmental Solutions for Communities grant program, collaboration with National Fish and Wildlife Foundation that seeks to help communities create a more sustainable future through responsible environmental stewardship. Van Tassel’s work aligns closely with the company’s vision to encourage responsible practices and the integration of environmental policies and processes into company operations and within community engagement programs. You can follow her posts on community and team member engagement through the Wells Fargo Environmental Forum or on twitter @kristavantassel.